Do you have a timeshare contract you no longer want to be party to? Timeshares seem like a great deal, until they’re not. The upfront fees can be as much as $19,000, plus annual maintenance fees. Not a small amount by any means. Many people sign up for a timeshare while on vacation, then realize it’s a costly mistake. They are generally a bad choice in the long run. And if you hold on to a timeshare you don’t want, it will cause unnecessary expense and become a headache. If you find yourself owning a timeshare after coming home from a vacation there may still be a way to get out of your timeshare. Keep reading, because you’re about to find out how you may be able to have your timeshare contract canceled. First things first, this is going to be a painful process getting out of your timeshare and you are going to lose money, in fact, it may even cost you more money to rid of your timeshare. Contact the resort and see if they will take back. However, understand this is rare and they are not obligated to take back the timeshare because you changed your mind. However, trying to sell your timeshare is almost always a bad idea. Why? There is no resale value, you can find them everyday on Ebay(R) for $1.00, yes that’s one dollar. People sell them just to get out of the lifetime of annual maintenance fees. In order for them to consider your offer, you need be in good standing and the unit should be paid off. You may be able to do a “deed back”, which means signing the deed or interest over to the resort. It’s most likely you won’t get any money for it and you may have to pay a fee to transfer. Approach the condo association and find out if the resort is open to your offer. Whatever you do, don’t stop paying maintenance fees as it will damage your credit and lead to foreclosure. Then you won’t have a property, and you’ll still be liable for the fees. There is a legal way to cancel a timeshare contract that can work if you act in time. 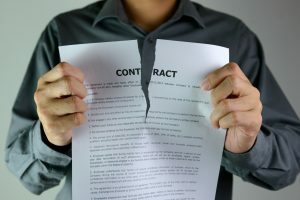 When you sign the document, it is a legal and valid contract. This means it’s covered by normal contract law. “Rescinding” basically means the act of you canceling your obligations under the contract. The time period you have to rescind will be stated in the contract, and you can check your state’s laws as well. Usually, this period is between three to fifteen days. If you were pressured into signing up for a timeshare a few days ago and regret it, the time to act is now. In order to go ahead with the cancellation, you must do it in a certain way. The standard method to cancel a timeshare contract is to send your decision in writing. For detailed instructions, you must look at your contract’s cancellation policy. It will usually specify that the cancellation letter includes certain things. Some of these might include the purchase date, your personal information, and a timeshare description. It’s vital that your letter includes a clear intention to cancel. You don’t need to state a reason for your cancellation. But it’s good form to include a request for a confirmation that your letter was received. It’s not a good idea to call, as the salesperson will usually try to persuade you not to cancel. If you do call the company, be sure to speak to a manager. Definitely don’t speak to the same salespeople who sold you the timeshare in the first place! The method of delivery is extremely important for the timeshare cancellation to be effective. It will be specified in your timeshare contract and can range from hand delivery to certified mail. If you don’t follow the instructions exactly, it’s possible your rescission could be rejected. Be sure to make copies of the letter before you send it. Also, make copies of your agreement and any other relevant documents if you send the originals. Be sure to mail it certified return receipt. Sometimes the timeshare itself isn’t the problem, the loan you took out for it is. You can keep your timeshare by refinancing your loan so that you don’t have to cancel a timeshare contract. It’s not mandatory to stick with the rate the timeshare developer gave you. While you will need a good credit record, this option can shave a lot off your repayments. Shop around for the best options. Once you have moved your loan to another lender, this opens up possibilities. You can then look into getting rid of your timeshare because you don’t have a high mortgage to pay. What should you do if you can’t cancel a timeshare contract? In this case, selling the timeshare is the easiest option. Sadly, a timeshare isn’t like a normal property. It doesn’t increase in value year by year. Even if you sell it at a loss, however, you will have gotten out of a costly contract. Your best bet is can contact a licensed firm that specializes in timeshare matters. You can also look for a buyer yourself by posting an ad on the internet, however SELLER BEWARE! This is laden with scams and most people lose money pursuing this path, again the sad fact is there is no resale value for the majority of all timeshares. Another choice you can make is to donate the timeshare to a charity. A local charity can sell the use your week at an auction to raise money. If you get a bigger organization, they can even take over the payments. The great thing about donating is that you can get a tax deduction to offset the money you’ve spent on the timeshare. This is far more difficult to do than it appears. While there are some steps you can take to cancel a timeshare contract yourself, in most instances, you will need professional help. Or your time to cancel may have passed and you need to find other options. In a case like that, you should get in touch with a trusted timeshare attorney. A lawyer may also be able to find a way to get you out of your contract even if the rescission period has passed. Go ahead and contact us today, our consultation is free. The sooner you call, the sooner you can get out from under your costly timeshare.